Our neighborhood has been overrun with little black ants. These are what some people call "sugar" ants, even though they seem to like protein as much as anything. They're also called "odorous" ants because of the odor they give off when you crush one of them. That name naturally morphs into the best name of all: "odious" ants. If you've ever had an ant problem, you know what I mean. My neighbors and I have tried countless sprays, traps and gimmicks. The only product we've found that works with any consistency, and is relatively non-toxic to humans, is Terro liquid ant bait. When the ants come marching in, we put out the bait traps, and in a few days the ants are (mostly) gone. A few weeks later, though, they come back and we repeat the process all over again. This system worked well for me until last fall, when I had the worst infestation ever. 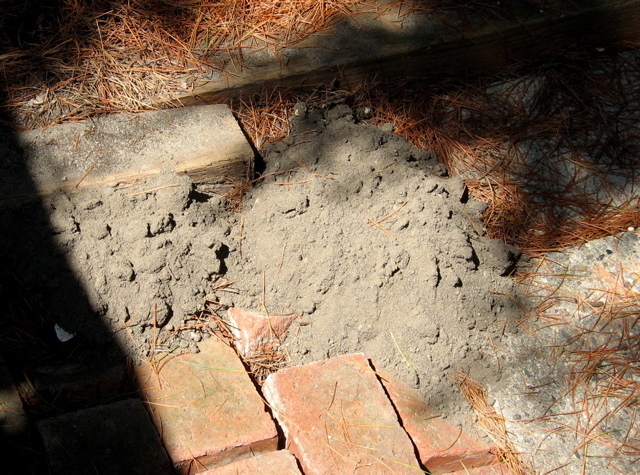 I put out the traps as usual, but this time the ants completely ignored them. There were billions of the damn things crawling up and over every surface of my kitchen. Putting food away immediately, cleaning countertops, sealing up trash containers - nothing discouraged them. I was so frustrated I was ready to resort to using the most toxic spray I could find, and then I came on a bit of inspiration. 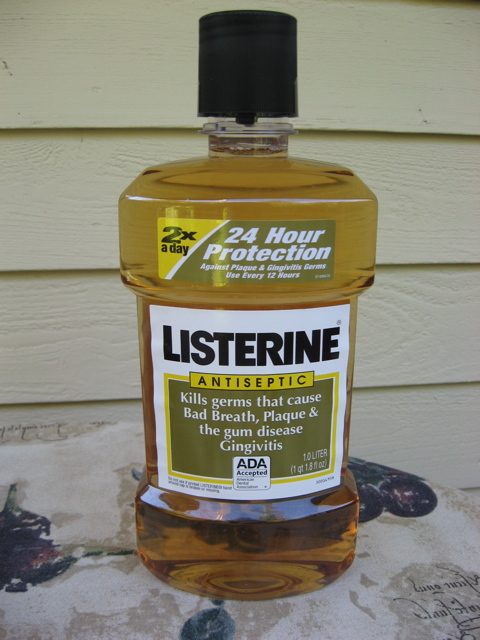 I had been reading posts on the People's Pharmacy website about off-label uses for Listerine. People have reported good results using it to relieve shingles pain, get rid of dandruff and cure toenail fungus. I figured that if Listerine could kill a fungus, maybe it would kill ants, too. So I bought a big jug of good old-fashioned amber Listerine and tried it. Crazy as it might sound, it worked. I put some in a spray bottle to zap the ones on the kitchen counter. (Seems like anything you can use as a mouthwash should be safe to use around food.) The Listerine kills the ants on contact. That was a step in the right direction, but every hundred I killed was replaced by two hundred more. It was time play amateur exterminator and go outside to figure out where they were coming from. That's where I got the best results, pouring Listerine into ant hills, like the one you see above. I found hills in a few places along the foundation of the house and a huge one near our garbage and yard waste containers. I took a stick, made a little well in the top of each hill, and poured in some Listerine. Then watched and waited. Whenever I saw more dirt pushed up around the hill, usually within a day or two, I added more Listerine. If I saw more ants in the house, I made the rounds again, topping up each nest with more of the golden mouthwash. The more I did this, the fewer ants I found in the house. This took maybe a couple of gallons of Listerine, all told. After a while, there was just the occasional stray and then there were none. I went for months without seeing a single ant. Then in just the past week, we had a weather change (which does seem to be a trigger for them to start marching) and suddenly there was a trail of little black ants crawling along my countertop again. I put out the Terro ant bait, which they went for this time, sprayed the Listerine, went outside and poured more Listerine into old ant hills, and within two days, no more ants. From what I've read about these ants, they build deep nests and are adept at adding new colonies. I don't expect I will ever be ant-free. But thanks to Listerine, I think I'll have the upper hand. My R-Rated Horticultural Limerick post, which languished here for months with hardly any readers, has suddenly become one of the all-time, top-10 most popular posts on this blog. I don't know what accounts for this sudden popularity, but there you are - one of the many mysteries of life online. The silly season is back! After a hiatus of a couple of years, the world-renowned Bainbridge Island Limerick Contest has returned. This year the theme is "Bainbridge-O-Rama"--which pretty much encompasses anything specifically having to do with Bainbridge and our idiosyncratic ways here on "The Rock." Break out your rhyming dictionary and brush up on the form--proper syllable count and scansion will come to play in the judging--and let your creative juices flow! Bring your poems to the store and give them to Ann or John, or mail them to Limerick Contest / Eagle Harbor Book Co. / 157 Winslow Way E. / Bainbridge Island, WA 98110. Winners will receive gift certificates, and a gala reading with winners, Honorable Mentions and Editors' Choices will take place on April 18 at 7pm--right in the heart of National Poetry Month! I don't think you have to live on Bainbridge Island to enter, but you can ask the folks at Eagle Harbor Book Co. to be sure. Find contact information on their website.